Keep an eye on water levels this year with Stream Flow and Water Level Data from the USGS websites. 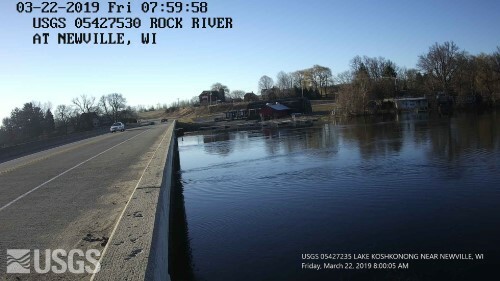 They recently added Time Lapse video monitoring at Newville Bridge and Robert Street Bridge in Fort Atkinson. The Rock Koshkonong Lake District mission is to protect, preserve and improve the natural resources of Lake Koshkonong and the Rock River for an equal balance of wildlife, habitat and recreation. The Rock-Koshkonong Lake District is the largest lake district in the State of Wisconsin, spanning three counties – Rock, Dane and Jefferson. Formed in 1999 to better manage the resources of the Rock River and Lake Koshkonong, the Rock-Koshkonong Lake District boundary starts at the Indianford Dam on the Rock River, includes Lake Koshkonong and continues north to the Jefferson city limits.